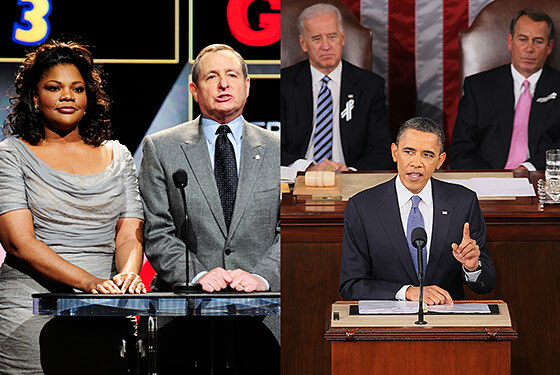 How Did the State of the Union Stack Up Against the Oscar Nominations Announcement? The State of the Union vs. the Oscar Noms: How Different Were They? Two things can dominate a news cycle over all else: Hollywood and the president. So what are the odds of both holding two of their biggest announcements — Oscar nominations and the State of the Union — on the same day? Today’s newspapers are filled with articles analyzing yesterday’s presentations separately, but perhaps they’re better looked at side to side. Granted, Mo’Nique didn’t go on quite as long as President Obama, but there were still surprising overlaps. Guests 400-plus members of the international media 400-plus members of Congress; the Justices of the Supreme Court; the Joint Chiefs of Staff; the Cabinet; Kathy Proctor, a 55-year-old student at Forsyth Technical Community College; Diego Vazquez, a college freshman; Gary and Robert Allen, roofers; the family of Christina Taylor Green; Al Franken. Refrains The King's Speech "Win the future." Surprises Javier Bardem Doubling our exports?! Zuckerberg Shout-outs The Social Network's eight nominations "We're the nation of Edison and the Wright Brothers, of Google and Facebook."